Office Depot/Office Max has partnered with the folks who created the Elf on the Shelf Christmas phenomenon and the associated Elf Yourself app and the creators of The Mensch on a Bench. The result? They've added a Jewish twist to the funny dance videos that let you add yourself and up to four others into the animated action. Most of the animated dances feature familiar songs about Christmas and the winter holiday season. But now you can create a Chanukah themed dance, featuring the Hanukkah phenomenon, the Mensch on a Bench, and the popular a capella group, the Maccabeats, singing Oh Chanukah! 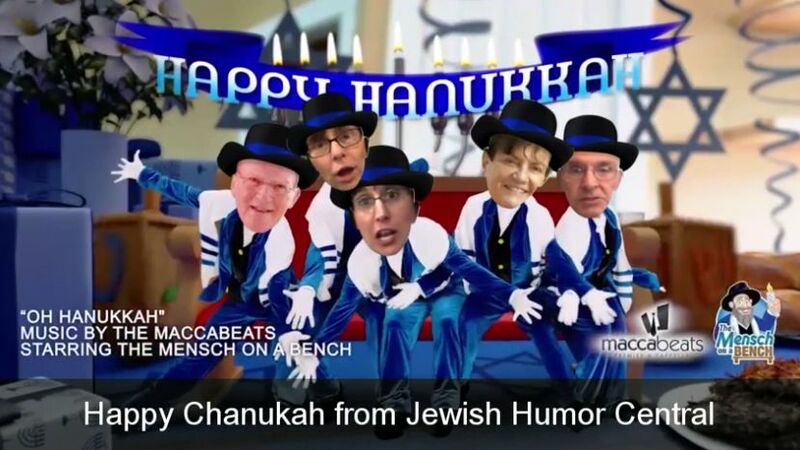 We've joined in the fun and created a video featuring the five members of our staff dancing like we've never danced before and wishing you a Chanukah that's filled with enough light and laughter to last eight days. You can do the same with photos of your family and friends. Just follow the directions at elfyourself.com and choose the Hanukkah theme from among the many offered. חנוכה to all of you. Wow!!!! I did not know you were such a fantastic dancer, Al. Now that's a Chanukah gift I didn't expect. Keep dancing. Where can I get the link?